Ok, so yeah it might be a little weird that I made this dish right on the cusp of summer, but let me start off by telling you that on the day that I enjoyed this traditional Vietnamese soup, the high for the day was somewhere around 55 degrees and it rained all day. Pho was entirely appropriate and it brought a certain warmth into my soul that no other soup has ever been able to accomplish. Yeah, that's how good. Pour the broth and water into a large pot and bring to a boil. Add the rest of the ingredients except rice noodles. Bring to a boil and then reduce to a simmer. Let simmer for 30 minutes or so. Then strain. In the middle of your serving bowls mound up about a 1/2 c of your noodles and pour around 2 c of your delicious broth on top. 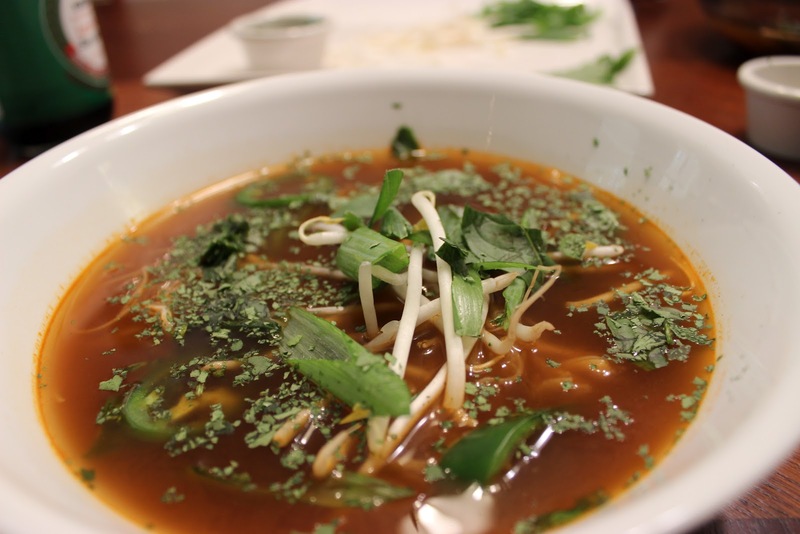 Serve with fresh bean sprouts, the green parts of the scallions, cilantro, basil leaves, mint leaves, fresh jalapeno slices, lime wedges, sriracha, and soy sauce.